Precious metals futures ended mixed on Friday and, for the most part, were little changed on the week. Gold gained for a second day in a row but still posted a weekly loss — its third straight. Gold for June delivery rose $2, or 0.2%, to settle at $1,314.70 an ounce on the Comex division of the New York Mercantile Exchange. "The primary deterrents to a gold, silver and platinum rally would be sustained reversals of favorable trends in inflation, stock-market volatility and the weakening dollar," according to Bloomberg Intelligence strategist Mike McGlone. "Recent strength in the buck on the back of higher Treasury yields should be a short-lived headwind." Gold futures traded 0.7% lower this week. They declined 1.1% last week and slipped 0.7% in the week before then. On Wednesday, they finished at $1,305.60 an ounce to register their lowest settlement since March 1. The yellow metal is now just 0.4%% higher for the year so far. "Eighteen market professionals took part in the survey. 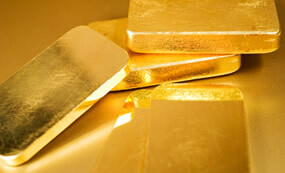 Twelve respondents, or 67%, called for gold prices to rise over the next week. Another four voters, or 22%, looked for gold to fall, while two, or 11%, called for a sideways market. Meanwhile, 809 voters responded in an online Main Street survey. A total of 557 respondents, or 69%, predicted that gold prices would be higher in a week. Another 183 voters, or 23%, said gold will fall, while 69, or 9%, see a sideways market." Ending higher for a third straight session, silver for July delivery added 7.2 cents, or 0.4%, to end at $16.519 an ounce. Silver futures traded 0.7% higher this week after sinking 4.4% last week. Silver has dropped 3.7% since ending last year at $17.145 an ounce. July platinum added $6.30, or 0.7%, to $910.30 an ounce, but ended 0.7% lower on the week. Palladium for June delivery shed $1.45, or 0.2%, to $957.25 an ounce, for a 0.6% weekly loss. The two metals are lower on the year to date with losses of 3% for platinum and 9.8% for palladium. Gold fell $5.65, or 0.4%, to $1,309.40 an ounce. Silver declined 5 cents, or 0.3%, to $16.415 an ounce. Platinum fell $1, or 0.1%, to $901 an ounce. Palladium declined $8, or 0.8%, to $963 an ounce. In weekly LBMA results, the losses reached 0.9% for gold, 0.7% for silver, 1.1% for platinum and 2% for palladium. Gold bullion coins rose by 1,500 ounce, matching gains from a week ago. Splits were the same for both weeks with sales of 1,000 ounces in American Gold Eagles and 500 ounces in American Gold Buffalos. American Silver Eagles rose by 230,000 coins this week after they advanced by 75,000 coins last week. Five-ounce silver bullion sales were muted for a second week in a row. Does anyone know how many (1.5in) Code Talkers Bronze Medals are there? One Code Talker bronze medal was approved by Congress in 2000 & approximately 50 approved in 2008. 51different ones in total if I remember right.